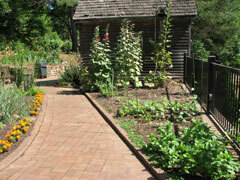 Visit our demonstration gardens and help us on workdays. The workday schedule is listed in the calendar section. Since the year 2000, the North Fulton Master Gardeners have spent hundreds of hours developing and maintaining the gardens at Autrey Mill. While the focus of our efforts has been the Summerour House Garden, we are starting to expand our efforts to other areas of the Preserve and Heritage buildings. This includes a rock garden and shade garden along the path to the Country Store, landscaping the Warsaw Church and maintaining the entrance and the long expanse of climbing roses and iris that line the bank to the Visitor’s Center. Master Gardeners work with Eagle Scouts and their projects to maintain consistency in the historical and aesthetic appearance of the Preserve. 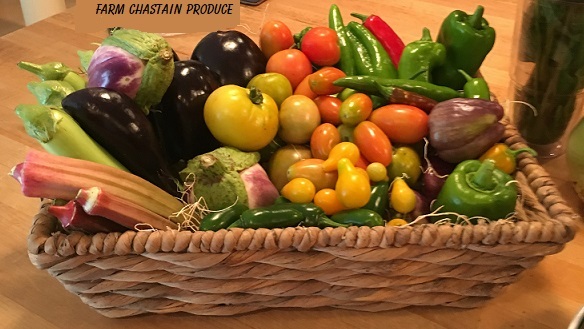 Click here to see a full description of our Autrey Mill garden projects - Click again to make the full description disappear. The Autrey Mill Nature Preserve and Heritage Center is a 46 acre Nature Preserve in North Fulton County with about two miles of trails and 8 historic buildings including a large Pole Barn. Some of the buildings were moved onto the property from within about a five mile radius of Autrey Mill. The Visitors' Center, deBray Chapel, Farm Museum, and Program Barn were original to this site. The Summerour House, Warsaw Church, Green Country Store, and Tenant Farmhouse were saved from demolition by Autrey Mill and moved from nearby locations. This village and its related exhibit pieces provide an understanding of this area's proud rural heritage from the mid 1800s to the mid 1900s and are used for educational programs at the Nature Preserve. 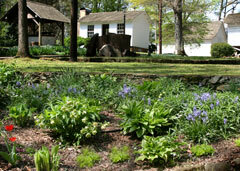 In February, 2007 the Summerour House Garden was renovated with native, historical plants, herbs and perennials that were available during the 1860’s when the home was inhabited by William Summerour and his family. This was accomplished through funding by Autrey Mill Board of Directors, North Fulton Master Gardeners, a grant from the state of Georgia Master Gardener Association and additional native plants donated by Fulton County. All of the garden maintenance, with the exception of the lawns, is performed by volunteers, Master Gardeners and various School Groups. We are committed to preserving the environment and use mostly organic controls for pests and invasive plant species. This includes; weeding, pruning, fertilization with compost, and eradication of invasive plants. Our workdays are the 4th Wednesday of each Month from February to December. The Big Trees Forest Preserve Master Gardener project is to develop and maintain a wildflower meadow. 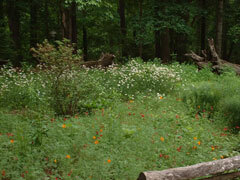 The meadow is planted with native plants to provide an education source. The meadow is supported to add diversity of native wildflowers to complement the existing trees and native plants throughout the Big Trees Forest Preserve. The Demonstration Garden at Bulloch Hall is located on the grounds of Bulloch Hall in historic Roswell, Georgia. In 1995, North Fulton Master Gardeners developed the Demonstration Garden as an educational site to provide the public with information about current horticultural knowledge that is beneficial to gardeners in this geographic area of Georgia. The geometric design of the Garden reflects many of the landscape traditions of ornamental gardens in the antebellum South (1820-1860). Click here to see a full description of our Bulloch Hall Demonstration Garden project - Click again to make the full description disappear. 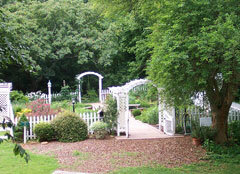 The Demonstration Garden at Bulloch Hall is located on the grounds of Bulloch Hall in historic Roswell, Georgia. The garden is maintained by North Fulton Master Gardeners, a volunteer group trained and certified in horticulture and related areas by the University of Georgia Cooperative Extension Service, College of Agricultural and Environmental Sciences. In 1995, North Fulton Master Gardeners developed the Demonstration Garden as an educational site to provide the public with information about current horticultural knowledge that is beneficial to gardeners in this geographic area of Georgia. The geometric design of the Garden reflects many of the landscape traditions of ornamental gardens in the antebellum South (1820-1860). Many historic plants of the period are present in the garden which is divided into four theme gardens: Children’s Garden, Butterfly & Hummingbird Garden, Herb Garden and Rose & Perennial Garden. The Garden is open every day and is free to the public. It is often used by professional and amateur photographers as a setting for wedding and family photographic sessions. This is the restoration and enhancement of the northside of the historic Bulloch Hall property on a slope originally known as Orchard Hill. There are currently no extensive plantings on this one acre site other than a few old shade trees around a restored shed, a pond, and the site of the future picnic pavilion. Once completed the picnic pavilion will be a busy public gathering place. A walking trail emerges from the deep woods to cross Orchard Hill. This trail will be the main public access to the area. We aim to create a vibrant, beautiful gem of a garden for the community's enjoyment. Click here to see a full description of our Orchard Hill project - Click again to make the full description disappear. This is the restoration and enhancement of the northside of the historic Bulloch Hall property on a slope originally known as Orchard Hill. There are currently no extensive plantings on this one acre site other than a few shade trees around a restored shed and a pond. Once completed the picnic pavilion will be a busy public gathering place. A walking trail emerges from the deep woods to cross Orchard Hill. This trail will be the main public access to the area. We aim to create a vibrant, beautiful gem of a garden for the community's enjoyment. The slope leading down to the pond was historically called Orchard Hill because it was planted with fruit trees. We will be recreating a portion of the orchard to demonstrate the types of fruit that can be grown successfully in this area. We will be selecting new plant material to suit the challenges of the site; i.e. storm water runoff problems, no supplemental irrigation, invasive plant species, and grazing deer and rabbits. We are designing with an emphasis on creating vistas of color, texture, and durability. Rocky outcrops, ephemeral seep, natural amphitheater, old terraced orchard, and a mostly dry wash are the natural features of the site. Our goals are to beautify Orchard Hill with a variety of native and tried-and-true plants; to restore a historic place in the community for more usage by the public; and to demonstrate how to keep storm water onsite, minimize runoff, and employ natural processes for water quality improvement. Our workdays are typically every Tuesday mornings. Farm Chastain is situated in the middle of Chastain Park which, at 268 acres is the largest City of Atlanta public park. We are an Urban Teaching Farm and all of our classes are taught hands on. We teach Farm Fresh monthly which is part of the 4H program. W also have Community classes 9 months of the year and partner with Cancer Wellness to teach classes monthly. We also host visits from scout groups, schools, garden clubs, and a variety of other groups. Our class schedule is listed on this website and are also listed on MeetUp Farm Chastain. The Smith Home, c.1845, has been an official NFMG project since it was approved on August 14, 2001. The ultimate aim of the project is ‘to transform the overgrown property into pleasant surroundings to showcase the house’. As a former terraced cotton plantation, the Smith Home and grounds are one of the best examples of architectural, cultural, and historical interpretation found in this region. Apart from professionals hired to cut grass and handle tree problems, etc. the grounds of the eight acre Smith property are maintained entirely by volunteers. Click here to see a full description of our Smith Plantation project - Click again to make the full description disappear. The Smith Home, c.1845, has been an official NFMG project since it was approved on August 14, 2001. The ultimate aim of the project is ‘to transform the overgrown property into pleasant surroundings to showcase the house’. As a former terraced cotton plantation, the Smith Home and grounds are one of the best examples of architectural, cultural, and historical interpretation found in this region. Apart from professionals hired to cut grass and handle tree problems, etc. the grounds of the eight acre Smith property are maintained entirely by volunteers. Master Gardeners have been working at the Smith Plantation since 1996, starting in areas such as the Hosta Garden and the Spring House. After the Pavilion was erected, the work area expanded to cover the section on the east from the Pavilion to the Springs. After several years’ hard work this area now boasts mulched paths, hundred of native shrubs, plants, and ferns; seating benches and descriptive plaques about the plants. In addition bridges allow pedestrians to cross over the streams. With completion of this stretch of woodland, it is now possible to expand the work area to the section north of the Pavilion where the loss of three very large trees makes the work more imperative. 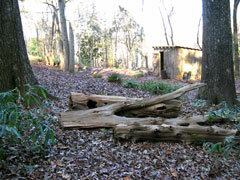 This section of the grounds will only be cleared and tidied, not extensively planted like the adjacent section. Volunteer activities run the whole gamut from weeding, watering, and maintaining the existing planted areas, restoring the dry stone wall on the far side of the Spring, cleaning and upgrading the bed of both streams, and as time permits, removing privet, brambles and vines from the area north of the Pavilion so that a walking trail can be established. The Williams-Payne House is a home built circa 1860. It sits on the site of Heritage Green, a park owned by the City of Sandy Springs and managed by Heritage Sandy Springs for the enjoyment of the public. 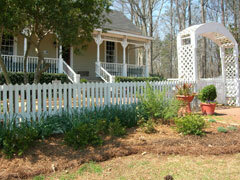 The Master Gardeners work in all the areas of the park with a concentration on the areas around the house. The areas closest to the house are planted with heirloom plants, and any other plants which might have been growing at the time the house was occupied. As we go further and further from the house, the plantings are not necessarily of that era. Click here to see a full description of our William-Payne House project - Click again to make the full description disappear. The Master Gardeners work in all the areas of the park with a concentration on the areas around the house. The areas closest to the house are planted with heirloom plants, and any other plants which might have been growing at the time the house was occupied. As we go further and further from the house, the plantings are not necessarily of that era. We try to plant native plants around and close to the Gazebo. There is also a garden at one end of the property known as the Memorial Garden, planted in honor of those who lost their lives in the 911 tragedy.